John Rousseau was four when he began his musical studies taking private piano lessons. After being inspired by a percussion performance, he joined the Lucan School of Music taking drum-kit lessons at 9 years old. As his dedication towards music grew, he decided to take it a step further. John was offered a place in the DIT Conservatory of Music and Drama as a junior student in 2013 and now is currently a 2nd year student at DIT studying a bachelor’s degree in music performance with Noel Eccles. Since starting his undergraduate studies John has played with many orchestras and bands such as the National Concert Hall’s young professional orchestra SinfoNua, The Irish Youth Wind Ensemble, The RTE Concert Orchestra and many more for both live concerts and recordings. John’s performances with the RTE Concert Orchestra include, among others, their live broadcast on RTE in the Bord Gáis Arena for the Centenary celebrations in 2016 and, in recent times, the ‘Sounds Amazing’ series and a John Williams tribute concert. John performed in Austria with the Irish Youth Wind Ensemble and went on tour around Ireland and to the UK to perform Odhrán O’Casaide’s Requiem for the 1916 Centenary. Closer to home, John has performed around Ireland with the Esker Festival Orchestra as well as being a full-time member of the Dublin Concert Band, winners of the National Band Championship earlier this year. 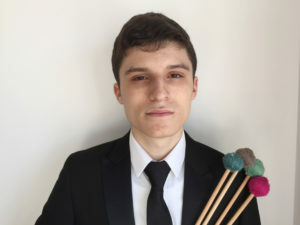 John has performed a wealth of solo percussion repertoire ranging from contemporary to classical while also maintaining a keen interest in percussion chamber music. John has performed many times with the DIT Percussion Ensemble and many other chamber groups within DIT. Later this year John will be a soloist with the Irish Film and Pops Orchestra to perform the soundtrack of the movie ‘Catch Me If You Can’ alongside the saxophonist Robert Finegan. Due to growing interest in other genres of music such as funk and jazz, John has joined Dysfunktional, a funk group where he plays auxiliary percussion. John is an avid fan of music education. He is the percussion tutor for the Rathfarnham Concert Band Society and led his pupils to win the Best Supporting Section award at the National Bands Championship. He is also involved with music education projects around Ireland such as Music Generation.